Pallidotomy is the destruction of a small region of the brain, the globus pallidus internus, in order to treat some of the symptoms of Parkinson's disease. The purpose of this operation is to relieve involuntary movements or muscular rigidity. The globus pallidus is a pale-appearing spherical area in the brain. The technique of pallidotomy involves the placement of a stereotactic head frame on the morning of surgery, using sedation and local anesthesia. The head is imaged by MR or CT scan. 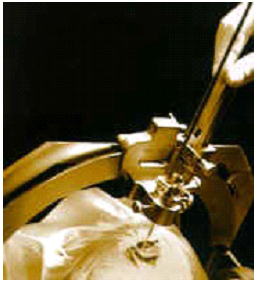 Next, a small perforation is made in the skull, again using local anesthesia, and a stereotactic guidance system is affixed to the head frame. The surgeon inserts a hollow probe through a small hole drilled in the skull to the target location. An extremely cold substance, liquid nitrogen, is circulated inside the probe. The cold probe destroys the targeted brain tissue. The probe is then removed, and the wound is closed. The surgery usually requires a 2-day hospital stay. Most people recover completely within about 6 weeks. Pallidotomy may reduce tremor, muscle rigidity, slow movement, and other motor symptoms. Balance and speech may be improved.It is not known how long the effects of pallidotomy can be expected to last.